We’ll forgive you for not recognizing them, but pictured above are a couple stars of tortoise conservation history. 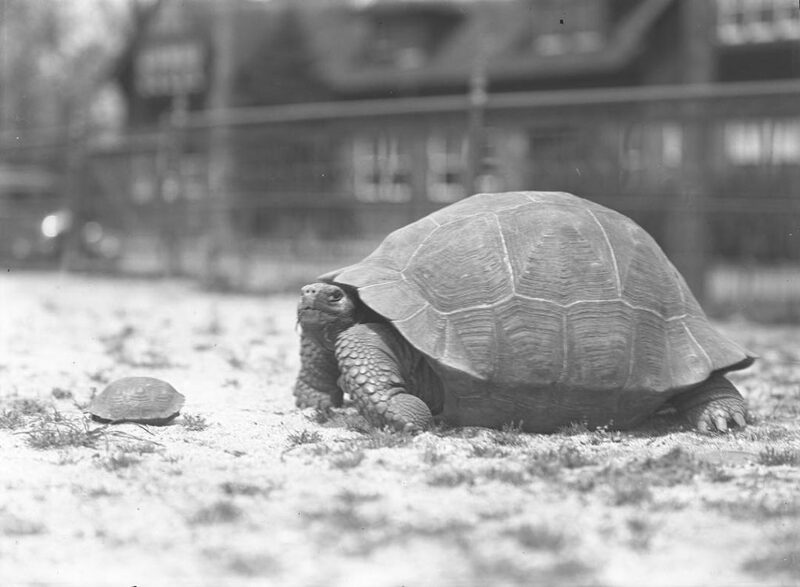 During the 1920s, New York Aquarium Director Charles Townsend became concerned about the declining populations of Galápagos tortoises. He warned of their impending extinction in a 1924 article published in the New York Zoological Society Bulletin. Townsend’s original research had led him to conclude that the tortoise had already disappeared from some of the Galápagos Islands, and he advocated for the animal’s preservation. In 1928, Townsend led a New York Zoological Society expedition to the Galápagos Islands. During this expedition, he collected 182 tortoises. With the goal of establishing captive breeding programs in order to thwart their potential extinction, he distributed these tortoises to zoos and aquariums around the world – with 23 coming to the Bronx Zoo, including the two pictured here. Read more about Townsend’s tortoises at Wild View.